A highly-advanced image guided therapy platform, enabling clinical teams to transition from x-ray only to benefiting from multi-modality imaging, work together more effectively, combine information sources and perform a variety of procedures with a unique user experience and increased lab performance. Our challenge was to design a solution that integrates the workflow of all kinds of equipment, systems and imaging modalities used in the interventional lab into flexible work spots while also maintaining excellent ease of use. This design of a new image guided therapy platform brings revolutionary workflow innovation. Hospitals are increasingly focused on improving efficiency and Azurion provides a number of features to support these efforts. By co-creating with clinicians and hospitals all over the world the developers were able to gather valuable field feedback of the solution in use and refine the design. Usability studies by an independent agency demonstrated excellent usability scores and recognition of the efficiency improvement features. The design of this image guided therapy platform features unparalleled flexibility in use, empowering the clinical team with anything they need at any work spot and tailored to the procedure at hand. Our holistic view on the image guided therapy suite workflow enabled us to create a unique user experience that feels consistent and increases lab productivity. • Full control of any application on screen in the exam room, even applications of 3rd parties. This limits traffic in the treatment area which prevents infections, because users do not have to walk to other work spots to complete their tasks. Around the world healthcare systems are struggling with rising costs and maintaining quality standards. Interventional therapy procedures also face these challenges. 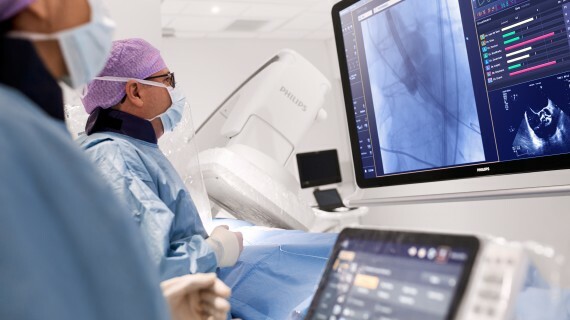 Improving the efficiency and quality of interventional procedures have been key drivers for us since we began developing interventional suites. This interventional suite is enabling minimal invasive therapies, reducing risk, improving outcomes lowering throughput time and costs.